Children of around 3-4 years of age, particularly crawling toddlers, are susceptible to significant health risks due to carpet hygiene issues. As kids are likely to put various objects lying around on carpets, they can come in contact with germs easily while crawling around on carpets. These drooling, licking, touching activities of small kids have been known to be at a significantly higher health risk on carpets than on floors. It is important for mothers to realize that carpets are much like giant sponges. Whatever is spilled on it will most likely stay inside and fester, unless taken care of in an expedient manner. Carpet’s uncleanliness aside, harmful cleaning routines can also pose significantly dangerous health risks to toddlers in some cases. So bottom line on carpet cleaning advice for a house with kids: stay clean and safe at the same time. 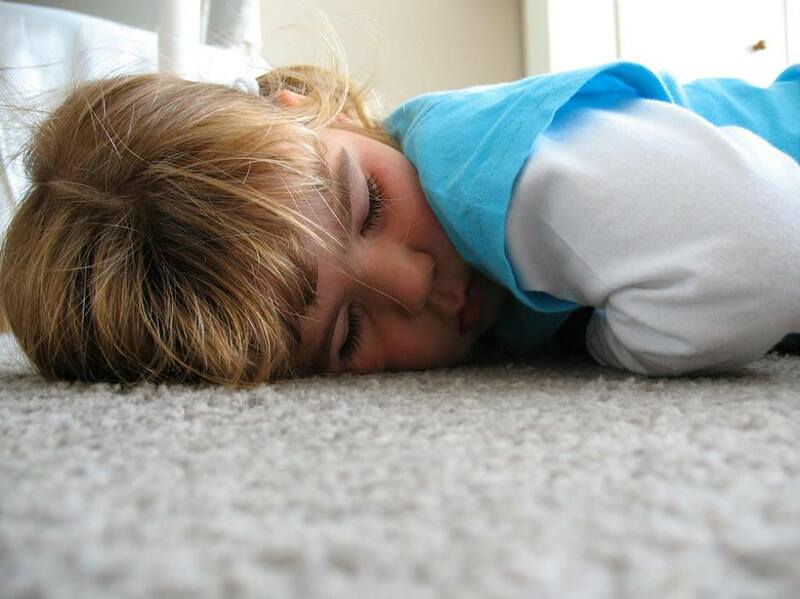 Below, we have listed some substances and actions related to carpet cleaning that pose harm to toddlers. Suggestions and alternatives follow the risks. Water spillages are the worse things you can ignore on your carpet. Yes, it will eventually absorb or even evaporate; however, the latent moisture is a breeding ground for bacteria and mold. Moldy carpets are extremely toxic for toddlers, who might come into direct contact with it. Moisture should be immediately aired and blotted to reduce the chances of mold. Carpet cleaning chemicals and even some devices can leave behind toxic residue. These harmful substances can cause a number of disorders or health risks to small children. Kids can be exposed to threats by not just through swallowing chemicals, but also through inhaling of fumes. Always check labels for mild/non-toxic carpet washing chemicals. It is important to be literate about chemical compositions and health-risk warning labels when you have kids in the house. Plenty of professional cleaning services use extremely harsh and dangerous chemical processes which can leave a dangerous amount of toxic residual fumes. These fumes are far more potent than regular domestic cleaning products, and, therefore, their after effects can easily last for days or even weeks. Hence, it is imperative that you opt for the right professionals who ensure the safety of your family yet ensure proper cleaning. Regular vacuuming, blotting of liquid spillages, and scraping of semi-solid spillages can cut down germ infestation. It is important to prevent germ and dust exposure by limiting dust access (doormats or window seals). While buying domestic cleaning chemicals, always go for milder and natural based remedies. If hiring a professional carpet cleaner, it would be prudent to research for kid-friendly alternatives. Nowadays, plenty of child-safe professional cleaners are operational. We at Advanced Surface Solutions ensure your carpets are cleaned without causing any harm to the kids or other family members.